Undeniable, for me anyway, the stroopwafel will have to be the ultimate biscuit to enjoy with a good coffee. 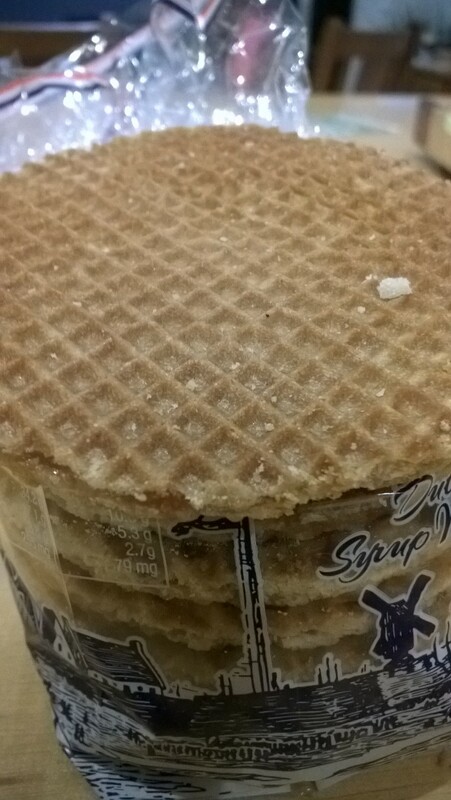 The stroopwafel consists of two thin wafers stuck together by a lovely sweet sugar syrup. The best way to eat them is freshly baked, still warm from a street vendor, syrup slightly drippy. Not what you would call healthy, but oh – so – good!! The second best way is when you get one from a packet, which you can luckily buy here in New Zealand. Just put it on top of your hot steaming cup of coffee or tea and wait for a minute or so. The steam of the coffee or tea will heat up the syrup, soften it and slightly heat the wafers as well. Then you bite. Oh yes, definitely undeniably the ultimate biscuit! Do you have another favourite? This entry was posted in A to Z challenge and tagged a to z, dutch. Bookmark the permalink. I’m afraid I have to disagree. Even though the French have some fantastic biscuits, the best ever is a simple chocolate digestive. Its the only biscuit for dunking. yes they are very nice too! thanks for connecting!